Chicago’s second-ever charter school strike ended in major contract victories for teachers at four schools in the Chicago International Charter School (CICS) network, including shortened work schedules, new limits on class size, and an average 35 percent pay increase. The strike, which lasted for two weeks and concluded in mid-February, demonstrates the sustained strength of the #RedForEd movement that started last spring in West Virginia and has sparked similar actions in Oklahoma, Arizona, California, and North Carolina, among other states. By going on strike, teachers across the country have pushed back on the rotten state of public education under capitalism, where in both “red” and “blue” states, schools are chronically underfunded, understaffed, and lacking in democratic control. The recent unionization and fightback among charter school teachers is a welcome new step in this fight, as charters have been one of the key tools of the billionaire-backed “school reform” effort to destroy public education. The Chicago Teachers Union (CTU) has shown the way forward in waging two historic strikes, correctly organizing public and private school educators into the same union to unite against underfunding, low pay, and the Democratic and Republican political establishment that has created the unacceptable status quo. These strikes have laid the foundation for future battles against the charter industry’s efforts to break up unions and undermine public education. 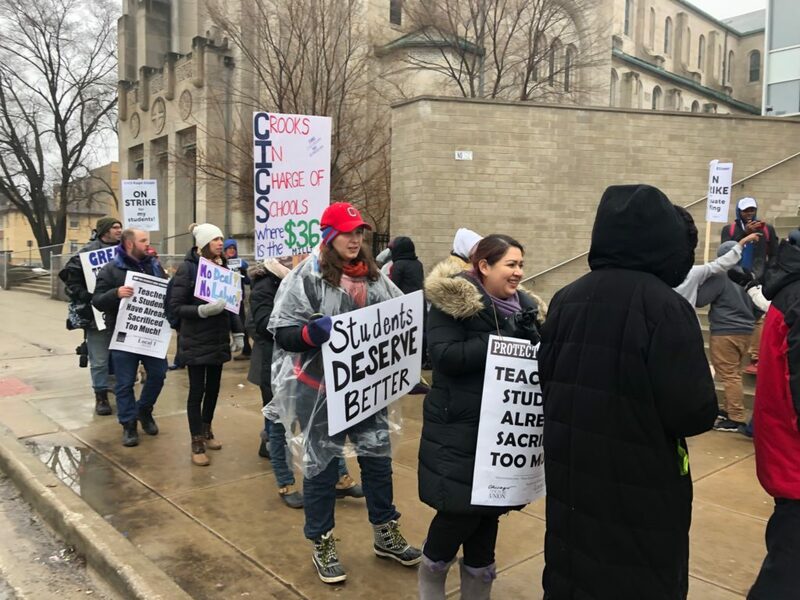 More struggles may be around the corner in Chicago as charter teachers organized with CTU at several different operators are currently in negotiations for fair contracts and better schools. The success of the CICS strike, along with earlier charter strikes in Chicago and LA, shows that workplace action can win big gains for working people. In the contract agreement with CICS, teachers won $5.5 million dollars in additional funding. Those millions of education dollars were won through sustained and escalating action by the teachers and their supporters. This meant not just picketing in front of schools each morning, but organizing daily rallies downtown, where the effort could gain more visibility. On day seven of the nine-day strike, still with no deal in sight, the union escalated further, physically blocking the entryway to CICS board President Laura Thonn’s office building. The picket lines at CICS. The union’s escalation, along with the possibility of the strike extending into a third week, added to the pressure on the charter school bosses to settle the strike. WIth the political establishment already divided, and with sections of it claiming explicit support for the strike, this was enough to force CICS management to the bargaining table and secure major concessions on the union’s main demands. The fight is not over. CICS management has already threatened that the concessions won by striking teachers might be paid for by cuts to staff. Any attempt to actually carry out these threats should be met with fierce resistance from CTU and the wider community. CTU has the ability to go much further in leveraging the full power of its more than 25,000 members in these fights than we have seen thus far. For instance, the union could plan rallies and actions with the aim of bringing in a much wider layer of support. And any future weekend strike rallies could be moved out of CTU headquarters and into the streets. Rather than basing themselves on a strategy of convincing and mobilizing all teachers to the support of charter strikes, CTU leaders have instead reverted to the strategy of appealing to politicians and the Chicago Democratic Party for support. The rallies for striking charter teachers have prominently featured local Democratic Party politicians, including Chicago establishment mayoral candidate Toni Preckwinkle. There should be no illusions that politicians like Preckwinkle, who claim to represent both big business and working people, will fight for what is necessary to meet the desperate needs of teachers and students in the city. Looking forward, for both organizing charter schools as well as for negotiations around the Chicago Public Schools contract which expires this year, the priority should be on preparing the union to vigorously stand its ground and undertake strikes if necessary. It’s urgent that CTU leaders move to build confidence in a bold set of CPS contract demands and a plan to fight in order to reignite the energy among both teachers and the wider community. If more charter teacher strikes become necessary due to the greed of private operators, these fights should be linked with the upcoming CPS contract struggle in order to mobilize immediate support behind them. Strikes and rallies can also give CTU a platform to make a wide call to parents, students, and working people broadly in the city: prepare to mobilize alongside teachers this year to fight for quality education for all! This must include strong efforts to unionize more charter schools, which would strengthen the union’s overall position and set back the efforts of anti-union education reformers. Beyond this, the fight should be connected to bringing charter schools back under democratic control and into the public school system. In the face of establishment opposition to its demands, CTU leadership should be prepared to bring the teachers’ strike wave to a new level of mass action in 2019. Next articleMueller Report Underlines Democrats’ Weakness – Mass Movement Needed to Defeat Trump!